Gensler has designed the new offices of e-commerce company Etsy, located in Brooklyn, New York City. Etsy’s new Brooklyn Headquarters is designed to showcase their culture of treating “Code as Craft.” The theme reinforces the celebration of making from end-to-end—spanning across both analog and digital space. Blurring the lines between workplace and habitat, the headquarters is on track to become the largest Living Building Challenge Petal-Certified project in the world. The design aspires to be a fully independent, regenerative ecosystem that sets a bar for a more dynamic and robust interpretation of sustainability. Through its materials story—sustainable, authentic, local, reclaimed—and its green embrace—nature permeating the space—the headquarters advances the potential for sustainability at all levels. During construction, 95% of the waste generated from building the office was kept out of landfills, just one of the ways Gensler was able to leverage the challenge to lower Etsy’s environmental footprint. As a result of this project, we estimate 60 new Declare Label certified products to be introduced to the global market, of which half will be maker goods. 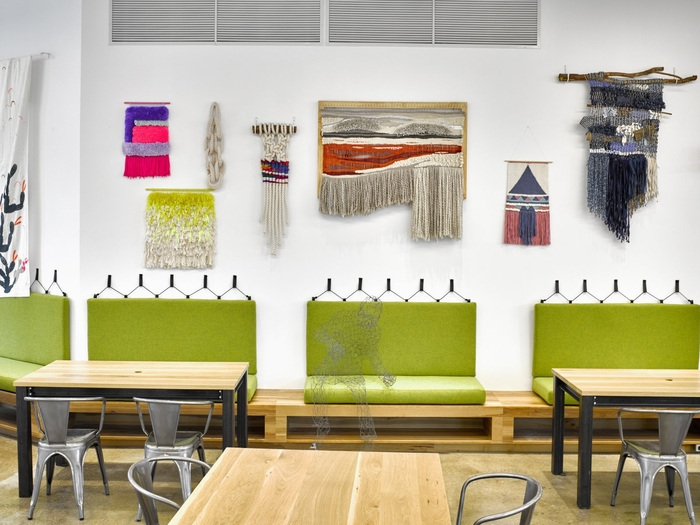 The entire building serves as the narrative to Etsy’s journey, and as a result, the four principle design concepts can be seen throughout the space. The makerspace provides opportunities for practicing, teaching and learning the art making on a daily basis. The workspace brings employees closer to nature both inside with greenscaping and outside with landscaped terraces and garden libraries. An ardent commitment to sustainability, authenticity and the shared community is omnipresent, from the reused wood of the water tower that used to top the building to the solar panels on the roof terrace. Never has a workplace been able to express itself so authentically as the new Etsy headquarters.